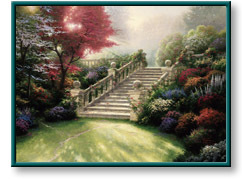 Stairway to Paradise art prints and canvases by artist Thomas Kinkade for sale. and surrounded by flowers of every color. imagination of the artist and viewers! Image Size: 25.5" x 34"
Studio Proof seal is applied to the back. letters S/P after the print number. Stairway to Paradise copyright© 1998 by Thomas Kinkade is prohibited from being copied. All applicable copyright© laws apply and are reserved by the artist Thomas Kinkade. Web pages copyright© 1998-2012 by Christ-Centered Mall, Inc. All Rights Reserved.